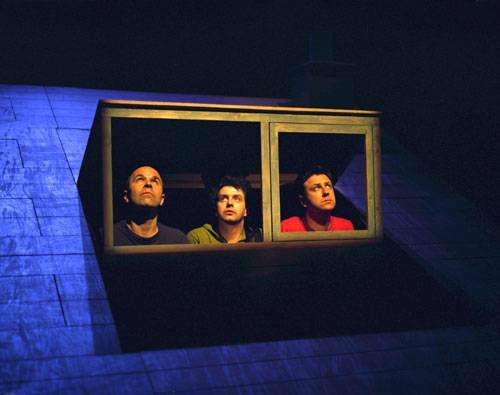 The UK’s Improbable Theatre has mounted some enormous — and enormously successful — productions in Minneapolis, from the extravagant Shockheaded Peter (2000) to the hilariously morbid The Hanging Man (2003). On their fifth Walker-sponsored visit, Improbable goes into more Spartan territory: a stage cleared of sets and costumes. There, armed only with a box of odds and ends (a bristle brush, a newspaper, a hand mixer) they’ll be performing live, improvising everything as they go. Improbable’s artistic codirector Lee Simpson likens this process–in which performers face an expectant audience with little more than their wits–to “ primeval gloop,” a powerful, mysterious state in which improviser and audience explore possibilities. Simpson and Walker performing arts curator Philip Bither recently discussed this promising, challenging, and terrifying place as a prelude to Improbable’s April 19–21 American premiere of ANIMO: UK/Minneapolis. 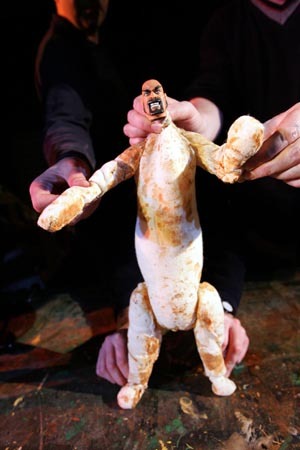 Philip Bither: Improbable Theatre has been together a little over ten years now and has gotten major recognition for large-scale shows such as Shockheaded Peter. Why do a project like Animo, an improvisational work like the pieces you did when you first started the company? Lee Simpson: I think the answer is in the question, really. The fact is that this is at the very heart of what we do. It’s like a little reservoir of stuff that we go back to, a reservoir of experience where we can go to make ourselves scared and vulnerable and off balance again. It doesn’t matter how long you’ve been doing it. It doesn’t matter how cool you think you are. It doesn’t matter how successful your last show was. When you step on stage in Animo, that’s it–you’re nothing. It wipes the slate clean. There’s nothing, and you face that nothingness and you find something out. And that’s the most scary and exciting thing. The reason why we do this, I think, is that it really gives us that kind of buzz. PB: It sounds in some ways like it’s the defining element of a performer’s courage. Is it as terrifying as it sounds? LS: It is sort of terrifying. We divest ourselves of not just a script, but we also try to divest ourselves of improvisational tricks. We try to make ourselves more naked than an improviser. So we try to lose structures or shapes or routines. The whole point of Animo is that it should look like it grows from nothing–or from what’s happening inside. PB: When you see improvisation in the states, sometimes you feel like it’s all being spontaneously created but there are these tricks or strategies that make you think, “ I haven’t seen this exact stuff, but I know where it’s going.” Animo doesn’t really have that feeling. LS: That’s absolutely true. We’re not in any way disassociating ourselves with that. That’s how I make my living–I’m a professional comedy improviser, and I love that stuff–but you also have to recognize that there is another approach that is as much about waiting and taking your time and silences and space and what comes out of that as what comes out of “ risking.” It’s about putting vulnerability on stage in a way that it’s possible to watch it. Obviously you don’t want to see people on stage being vulnerable, having a breakdown, bursting into tears and having a horrible time. So is it possible to be on stage, to be vulnerable, to hear what’s happening inside yourself, notice the little things that are happening with your friends on stage, and grow something out of that like a little culture in a Petri dish, and then build and grow that in what feels like an organic and natural way into something that’s very theatrical? PB: What would you say is your bargain with the audience? LS: I guess it’s just: come along with us please. Take an evening off, in a way. Sit in the theater. And we’re going to take an evening off from being clever and being prepared and if you guys can take an evening off as well, we maybe can go together on an unusual journey–a journey that you might not normally get to go on. And just wait with us in the space. Give yourself over to it to some degree. There is a kind of complicity between the performers and the audience, because in a sense we’re all in it together. I guess we ask them to trust us. I think the most painful thing for a theater audience is when something is happening on stage and it’s not working, but nobody can admit it’s not working. That’s really sort of painful. Like in a big opening night and there’s a lot riding on it. But the great thing about Animo is that we can confess. If a performer goes on stage and starts something and the audience is thinking, “ Oh my God, what’s he doing?”, another performer is allowed to go on and say to him “ Oh my God, what’re you doing? !” It’s not an embarrassing thing to do. PB: It’s actually probably empowering. LS: And the audience is going “ Ah, thank God. That’s what I wanted to say.” And we can deal with it, and we can say look, I think we should change directions. The thing about theater that’s created on the spot is that it’s redeemable at any moment. PB: It seems like there’s such a level of trust. 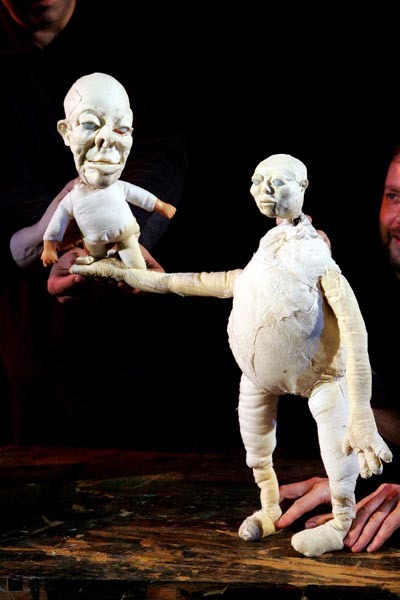 In Minneapolis you’ll be collaborating with some artists who live here, some great puppeteers and performers. Is it a scary proposition that you’ll only have two weeks to build up that trust, rather than the 10 years Improbable has been together? LS: Introducing people who have never met before is very exciting because it helps to achieve that thing that Animo is there for–to keep us off balance. Animo is there to keep us out of a comfort zone, and what new people bring is fresh new energies, fresh new propositions that knock you off balance and wake you up. It’s a bucket of ice-cold water over you, and can stop you from being complacent. PB: One of the things that might also give more grounding is the really great relationship you’ve had with this community. You’ve come back every couple of years with very different kinds of works, sometime in residencies, sometimes presenting new works in various theaters around town. This is the first time, actually, that you’ll be at the Walker. Can you talk about your experiences here? LS: We’ve always found that when we come to Minneapolis and to the Walker, there’s a sense of nurturing and excitement and interest in the work. The risks we take seem to be embraced. We’ve always felt a very warm response to things that sometimes would get raised eyebrows elsewhere. I think that’s why we’re always keen to return. And I also think that atmosphere has actually helped the shows we’ve brought there. The shows we’ve brought to you have grown. I think we’ve found more about what they’re about by being in that atmosphere. PB: Yeah, I remember with Spirit (at right, from Out There 2001), that was really a turning point for the work. It seemed to hit its stride when we were at the Southern Theater for that week and each show just got better and better. LS: That’s exactly right. There’s a relationship there. I’m sort of struggling to talk about it. It’s on a kind of “ feeling” level. It sounds weird, but it’s sort of about being taken seriously; which sounds like we want to be revered or respected, but we don’t. We don’t take ourselves seriously, and we encourage people NOT to take us seriously, but at the same time, it’s not dismissed. In Minneapolis, the way we approach work is not seen as slightly second class–a second-class citizen in the arts world because we devise or improvise. When we come to the city there’s a real excitement and a real interest in seeing, not just the end product, but the development that goes toward that. The journey, and the starting points and the gloop–the kind of primeval gloop–of our shows emerge. And Animo is very much a primeval–if any show is a primeval gloop, it’s Animo. PB: I recently read an article by a theater artist who defined the difference between “ performance art,” which is a much contested term–in the UK it’s referred to more as “ live art”–and theater. Performance is work that isn’t repeated over and over in an attempt to duplicate the same thing on stage night after night, if not year after year. In some ways you could define Animo as really more in the performance realm than the theater realm. My associated question is: do you think that the 21st century and younger audiences are more attuned to a kind of theater that isn’t as script-dependent–isn’t as much about chiseling over months, if not years, this finely honed script that is then performed over and over in this particular kind of way? How do you see your work being in tune with what’s happening culturally right now compared to the more “literary” theater world? LS: That’s an interesting definition between performance art, or live art, and theater. By that definition I would say there’s a lot of companies striving to occupy the space between performance and theater. I think we’re definitely one of those companies, because there is a kind of performance art element to the work, and most definitely, obviously with Animo or even with the scripted stuff, a sense that it’s happening tonight, and tonight should be unique. As theater gets squeezed, and it keeps getting squeezed, it has to look to what it does best, and to look to what it is in its most fundamental form. In its most fundamental form, it’s a room with a lot of people in it, and some people are watching other people do something. What’s unique about that is that the people who are doing the thing that people are watching, are there–they’re live human beings, and they’re awake, and they’re conscious. So the communication, as opposed to television or film, is two-way. It goes from the stage to the audience, of course, but it goes from the audience to the stage. It’s an event, and it’s an event that is shaped by the negotiation between the people on stage and the people in the audience. Now, you either let that negotiation in, or you deny it. We always aim to, at the very least, let it in. So in something like Shockheaded Peter or The Hanging Man, it’s allowed in, and it can affect what’s happening. With something like Animo, that’s the whole show. The content emerges from that negotiation. It’s a challenge, but of course it should be. Otherwise, why bother? Economically, theater is a very inefficient way to present art because the number of people that can see it in a quality way is very small. PB: Last question: I know, from working with theater artists, when the budget is enormous, the content is wide open, and there are no limitations whatsoever, it can be overwhelming. Sometimes when there are real restrictions placed on things–you have to create a five-minute work on a table and a chair or something–suddenly the creative juices start sparking. Is that the case with Animo? LS: Yeah! You know when you’re 19 and you have success and failure, and you make some huge mistakes, but somehow there’s something brilliant and vital about what you do. It’s possible to learn to avoid the mistakes, but somehow that can start to drain the very lifeblood out of the work. You can also learn to avoid pain and the struggle. PB: The human tendency, in all endeavors, seems to be to get more secure and to feel less vulnerable and to be less scared. So you’ve created a situation where you’re NOT in that secure place. LS: –and still produce vital, electrifying work, but it doesn’t seem to happen that way. You face a choice as an artist. Are going to go back into the fire and cook yourself a little bit more, or are you just going to sit by the fire and keep yourself warm?